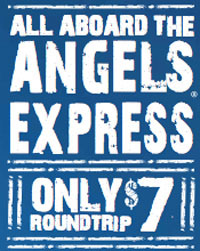 New Santa Ana | Take the $7 Angels Express train to any 7 p.m. weeknight home game! The Angels have some new, exciting players, including Albert Pujols and C.J. Wilson. 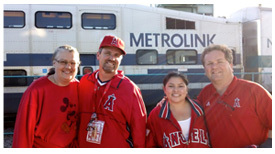 Just like last year, Angels Express tickets cost only $7 ($6 for seniors and disabled, and $4 for youth ages 6-18). You will also get a FREE GAME VOUCHER when you purchase your Angels Express ticket online, by phone or at the OCTA Store in Orange. Free ticket distribution starts at 5:00 p.m. Train 643 to Anaheim departs Irvine at 5:59 p.m. and arrives Angel Stadium at 6:20 p.m.
Visit www.octa.net/angelsexpress to learn more.